The minister spent the entire day on Friday at the kiosk set up by Kerala Tourism at the Indira Gandhi International airport. 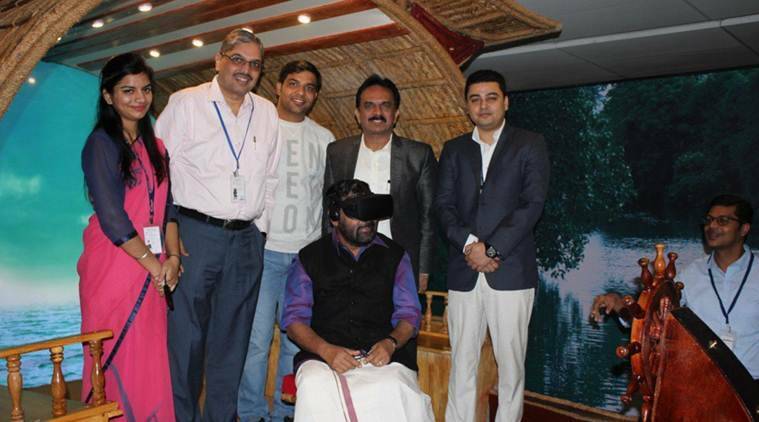 Kerala Tourism Minister Kadakampally Surendran took on the role of a host and guide at a unique virtual reality platform set up by his department at the international airport in New Delhi to give air passengers a taste of cruising through the state’s famed backwaters. The minister spent the entire day on Friday at the kiosk set up by Kerala Tourism at the Indira Gandhi International airport, greeting curious passengers drawn to the novelty of a life-size “kettuvallam” (houseboat) placed in the airport departure area and explaining how the technology works, a release said here. The backwaters have been brought to life through a two-minute film– specially shot using 360 degree technology using six cameras simultaneously, it said. Visitors can don a VR headset and be instantly transported 2,000 km away to a boat floating on the tranquil waters, listening in to conversations of locals going about their daily lives and watching the picturesque coconut palms, rolling paddy fields, birds, the sunset and other vistas from an actual cruise passing by. The VR “experience site”, the latest promotional and marketing initiative of Kerala Tourism, has attracted much attention since it went operational on October 28 and has signalled that Kerala remains at the forefront of using technology for tourism promotion, it said. “It was an amazing experience, even for someone like me who has actually been on a real houseboat cruise,” Surendran said of the virtual reality tour. “For a person who has never visited Kerala, I cannot imagine a more fantastic introduction. We definitely hope to see more people wanting to experience the real thing after what they have seen here,” he said. MPs from Kerala, including P Karunakaran, Vayalar Ravi, K Somaprasad, C P Narayanan, P K Sreemathi, M B Rajesh, P K Biju, Jose K Mani, K K Ragesh, K C Venugopal and Joy Abraham, and Kerala’s Resident Commissioner in Delhi Vishwas Mehta were among nearly 200 passengers who visited the kiosk and enjoyed the experience on Friday. The stall would remain open until December 12, after which it will move to the international airport in Mumbai. U V Jose, Director, Kerala Tourism, said technology would be an integral part of tourism promotion and marketing now and in the future. The VR zone at the IGI airport is part of the department’s ‘Out of Home’ marketing campaign to promote ‘Brand Kerala’ and is targeted at high net worth individuals in the domestic market. “We understand that technology helps us connect with people in better ways than conventional tools. Our future initiatives will certainly be focused on the hi-tech,” he said. Besides Mumbai, Kerala Tourism is planning to take the “experience site” to other airports, including Bengaluru, the release added.